^ 学者谈祭奠国民党抗战烈士：党争息，民族兴. 凤凰网. [2012-04-13] （中文（中国大陆）‎）. Bunting III, Josiah. Ulysses S. Grant. New York: Times Books, 2004. ISBN 978-0-8050-6949-5. Cox, Jacob Dolson. How Judge Hoar Ceased to be Attorney General. Atlantic Monthly Making of America (Cornell University Library). July 1895, 76 (454): 162–173 [2012-05-20]. Hesseltine, William B. Ulysses S. Grant, Politician. New York, F. Ungar Pub. Co. [1957, 1935]. ISBN 978-1-931313-85-8. Longacre, Edward G. General Ulysses S. Grant The Soldier And The Man. Cambridge, Massachusetts: First De Capo Press. 2006. ISBN 0-306-81269-X. Mantell, Martin E. Johnson, Grant, and the Politics of Reconstruction. New York, Columbia University Press, 1973. McFeely, William S. C. Vann Woodward, 编. Responses of the Presidents to Charges of Misconduct. New York, New York: Delacorte Press. 1974. ISBN 0-440-05923-2. Nevins, Allan, Hamilton Fish: The Inner History of the Grant Administration. New York, Dodd, Mead, 1936, 2 vol. Rhodes, James Ford. History of the United States from the Compromise of 1850 to the McKinley-Bryan Campaign of 1896. Volume: 6 and 7, 1920. Sarna, Jonathan. When General Grant Expelled the Jews. New York, NY: Nextbook Press. 2012. ISBN 978-0-8052-4279-9. Scaturro, Frank J. President Grant Reconsidered. Lanham, Md. : University Press of America, 1998. Simpson, Brooks D., Let Us Have Peace: Ulysses S. Grant and the Politics of War and Reconstruction, 1861–1868. Chapel Hill: University of North Carolina Press, 1991. Simpson, Brooks D. Ulysses S. Grant: Triumph Over Adversity, 1822–1865. Boston, Massachusetts: Houghton Mifflin. 2000. ISBN 0-395-65994-9. Simon, John Y. "Ulysses S. Grant". in Henry Graff, ed. The Presidents: A Reference History (2nd ed. 1997), pp. 245–260. Smith, Jean Edward. Grant. New York, New York: Simon & Schuster. 2001. ISBN 0-684-84927-5. Waugh, Joan. U.S. Grant: American Hero, American Myth. The University of North Carolina Press. 2009. ISBN 978-0-8078-3317-9. Wilson, Edmund. Patriotic Gore: Studies in the Literature of the American Civil War (New York: Oxford University Press, 1962), pp. 131–173 on Grant's Memoirs. Badeau, Adam. Military History of Ulysses S. Grant, from April 1861, to April 1865. New York: D. Appleton, 1881. Bearss, Edwin C.. The Vicksburg Campaign. Dayton, Ohio: Morningside, 1991. ISBN 978-0-89029-308-9. 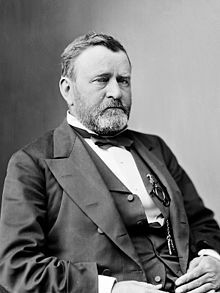 Bonekemper III, Edward H. A Victor, Not a Butcher: Ulysses S. Grant's Overlooked Military Genius. Washington, DC: Regnery. 2004. ISBN 0-89526-062-X. Bonekemper III, Edward H. The butcher's bill: Ulysses S. Grant is often referred to as a 'butcher,' but does Robert E. Lee actually deserve that title?. Civl War Times. April 2011, 52 (1): 36–43. Carter, Samuel III. The Final Fortress: The Campaign for Vicksburg, 1862–1863. New York: St. Martin's Press, 1980. Catton, Bruce. Grant Moves South. Boston: Little, Brown, 1960. ISBN 978-0-316-13207-7; Grant Takes Command. (1968). ISBN 978-0-316-13210-7; U. S. Grant and the American Military Tradition. 1954. Cavanaugh, Michael A., and William Marvel. The Petersburg Campaign: The Battle of the Crater: "The Horrid Pit," June 25 – August 6, 1864. Lynchburg, Va.: H.E. Howard, 1989. Eicher, John H., and Eicher, David J. Civil War High Commands. Stanford, Calif.: Stanford University Press, 2001. ISBN 978-0-8047-3641-1. Fuller, Maj. Gen. J. F. C.. Grant and Lee, a Study in Personality and Generalship. Bloomington: Indiana University Press, 1957. ISBN 978-0-253-13400-4. Farina, William. Ulysses S. Grant, 1861–1864: His Rise from Obscurity to Military Greatness. Jefferson, North Carolina: McFarland & Co. 2007. ISBN 978-0-7864-2977-6. Isbell, Tim. Fort Donelson Victory Brings Forth 'Unconditional Surrender' Grant. Sun Herald (Biloxi-Gulfport and South Mississippi: SunHerald.com). 2012-02-13 [2012-02-13]. Gott, Kendall D. Where the South Lost the War: An Analysis of the Fort Henry-Fort Donelson Campaign, February 1862. Mechanicsburg, PA: Stackpole Books, 2003. ISBN 978-0-8117-0049-8. Korda, Michael. Ulysses S. Grant: The Unlikely Hero. New York: Atlas Books/HarperCollins, 2004. Lewis, Lloyd. Captain Sam Grant. Boston: Little, Brown, and Co., 1950. ISBN 978-0-316-52348-6. McWhiney, Grady. Battle in the Wilderness: Grant Meets Lee. Fort Worth: Ryan Place Publishers, 1995. McDonough, James Lee. Shiloh: In Hell Before Night. Knoxville: University of Tennessee Press, 1977. McDonough, James Lee. Chattanooga: A Death Grip on the Confederacy. Knoxville: University of Tennessee Press, 1984. McPherson, James M. Battle Cry of Freedom: The Civil War Era. New York: Oxford University Press, 1988. ISBN 978-0-19-503863-7. Maney, R. Wayne. Marching to Cold Harbor. Victory and Failure, 1864. Shippensburg, Pa., US: White Mane Pub. Co., 1994. Miers, Earl Schenck. The Web of Victory: Grant at Vicksburg. New York: Knopf, 1955. Mosier, John. Grant. New York: Palgrave MacMillan, 2006. ISBN 978-1-4039-7136-4. Rhea, Gordon C. The Battle of the Wilderness May 5–6, 1864. Louisiana State University Press, 1994. ISBN 978-0-8071-1873-3. Rhea, Gordon C. The Battles for Spotsylvania Court House and the Road to Yellow Tavern May 7–12, 1864. Louisiana State University Press, 1997. ISBN 978-0-8071-2136-8. Rhea, Gordon C. To the North Anna River: Grant and Lee, May 13–25, 1864. Louisiana State University Press, 2000. ISBN 978-0-8071-2535-9. Rhea, Gordon C., Cold Harbor: Grant and Lee, May 26 – June 3, 1864. Louisiana State University Press, 2002. ISBN 978-0-8071-2803-9. Schenker, Carl R., Jr. "Ulysses in His Tent: Halleck, Grant, Sherman, and 'The Turning Point of the War'". Civil War History (June 2010), vol. 56, no. 2, p. 175. Simpson, Brooks D. "Continuous Hammering and Mere Attrition: Lost Cause Critics and the Military Reputation of Ulysses S. Grant". The Myth of the Lost Cause and Civil War History. Bloomington: Indiana University Press, 2000. Simpson, Brooks D. "After Shiloh: Grant, Sherman, and Survival". The Shiloh Campaign. Carbondale: Southern Illinois University Press, 2009. Steere, Edward. The Wilderness Campaign. Harrisburg, Pa.: Stackpole Co., 1960. Williams, Kenneth P. Lincoln Finds a General: A Military Study of the Civil War. New York, Macmillan, 1959 (volume 5). Williams, T. Harry, McClellan, Sherman and Grant. New Brunswick, N.J.: Rutgers University Press, 1962. Woodworth, Steven E. Nothing but Victory: The Army of the Tennessee, 1861 – 1865. New York: Alfred A. Knopf, 2005. ISBN 978-0-375-41218-9. Grant, Ulysses S. Personal Memoirs of U.S. Grant. C.L. Webster & Co., 1885. Johnson, R. U., and Buel, C. C., eds. Battles and Leaders of the Civil War. 4 vols. New York, 1887–88. Porter, Horace. Campaigning with Grant. Alexandria, VA: Time-Life Books, 1897. Sherman, William Tecumseh, Memoirs of General William T. Sherman. 2 vols. New York: D. Appleton, 1875. Booknotes interview with Brooks D. Simpson on Ulysses S. Grant: Triumph Over Adversity, 1822–1865, July 16, 2000. Booknotes interview with Mark Perry on Grant and Twain: The Story of a Friendship That Changed America, July 18, 2004.